Stephanie Grisham, a spokeswoman for the first lady, slammed the minute-long trailer as "disgusting"
T.I. has made no secret he's not a fan of Donald Trump. But Melania Trump's spokeswoman says his new teaser video goes too far. A spokeswoman for first lady Melania Trump is calling for a boycott of T.I. after the rapper released a teaser video depicting a woman strongly resembling the first lady performing a striptease in the Oval Office. 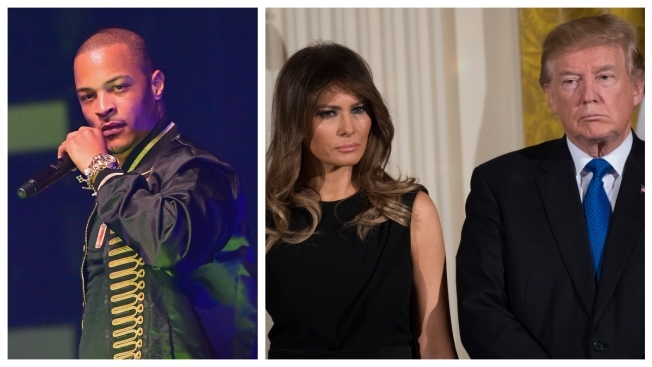 T.I., whose real name is Clifford Harris, tweeted Friday, “Dear 45, I ain’t Kanye” before sharing the video, which shows a woman who looks like Melania Trump entering the Oval Office wearing only high heels and a green jacket that reads “I really don’t care. Do you?” In June, Trump made headlines wearing a similar jacket to the Texas border to visit immigrant children separated from their parents. Stephanie Grisham, a spokeswoman for the first lady, slammed the minute-long trailer as "disgusting." The video has racked up over 1.5 million views on T.I. 's Twitter account.